God's ways defy all logic. God's ways are always different than we imagine. God loves everyone, but probably prefers "fruits of the Spirit" over "religious nuts. 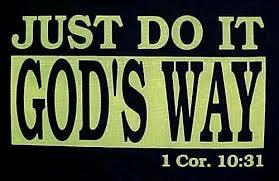 God's ways are always the best ways. Is it logical that God would send a person who is seated in a wheelchair since childhood into the mission field in a Third World country? Most people would say no but He does. I have learned not to reason myself out of situations that I know God is leading me in even when, logically speaking, it makes no sense in the natural. Allow God to lead you by the unction of the Holy Spirit and the Truth of His Word. Find a penny pick it up, please! MAXINE speaks out on JESUS! You go girl! What's In Your Love Tank? Marketing Mania - Who are you trying to represent anyway?